Dose Safety | Working to improve the lives of those with diabetes. Working to improve the lives of those with diabetes. The updated Dose Safety Controller (DSC) is an artificial pancreas (AP) device controller which serves to reduce the high cognitive load on people with T1D. Click here for a list of features. Automated insulin administration includes hybrid closed loop and fully automated closed loop with no premeal bolus required. Automated insulin administration is through use of a control method called fuzzy logic, which makes it easy for a physician’s expertise to be put into the insulin pump, like having an endocrinologist with you at all times. 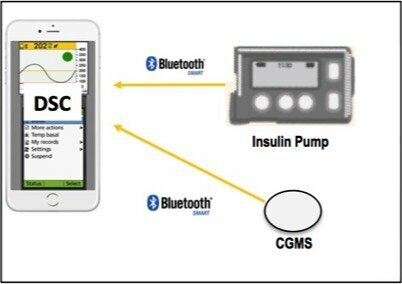 The DSC allows closed-loop insulin dosing only when the Continuous Glucose Monitor (CGM) and insulin pump are operating normally. When the DSC detects something is wrong, it suspends insulin dosing and reverts to the user’s preprogrammed basal. Automated insulin delivery resumes when problems are resolved. We are also co-developing an AP investigational device with an insulin pump company and a CGM company for use in our upcoming NIH-funded outpatient clinical trials. The updated DSC will be validated in those clinical trials.